1300-1-BGC Features: -Mixed hardwood frame; generously padded with polyester fiber fill and densified fibers for comfort and safety. 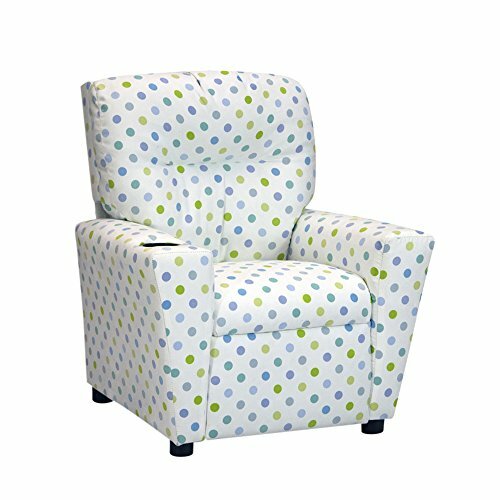 -This chair is then upholstered in one of our new 100% brushed polyester fabrics featuring a white background with an all-over pattern of small polka dots in shades of blues, lilac, lavender, and greens. -Round plastic cupholder recessed into top of right armrest. Product Type: -Chair. Frame Material: -Wood. Country of Manufacture: -United States. Dimensions: Overall Height - Top to Bottom: -28". Overall Width - Side to Side: -24.5". Overall Depth - Front to Back: -23". Overall Product Weight: -32 lbs. Dimensions: 24.5W x 23D x 28H in.